West Chester bed and breakfast travel guide for romantic, historic and adventure b&b's. 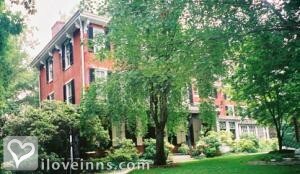 Browse through the iLoveInns.com database of West Chester, Pennsylvania bed and breakfasts and country inns to find detailed listings that include room rates, special deals and area activities. You can click on the 'check rates and availability' button to contact the innkeeper. West Chester, Pennsylvania first gained a reputation as a university town. Now, with its many attractions, it has proven itself to be much more with Longwood Gardens, known for its horticultural wonders. Wintherthur Museum and Gardens is another interesting spot in the city. It is the original home of the DuPont family. A similar sight nearby is Nemours Mansion and Garden. Other important museums in West Chester are Hagley Museum and Library, Brandywine River Museum, and Christian C. Sanderson Museum. The American Helicopter Museum and Education Center and Chester County Historical Society are two others worth visiting. For those who love cultural performances, the Media Theatre for the Performing Arts is the option. More interesting spots and activities include QVC Studios, Chaddsford Winery, and Marsh Creek State Park. Trips can be arranged from West Chester bed and breakfast inns. By Faunbrook Bed & Breakfast.